Too Much Stuff? Give the Gift of Time Instead. 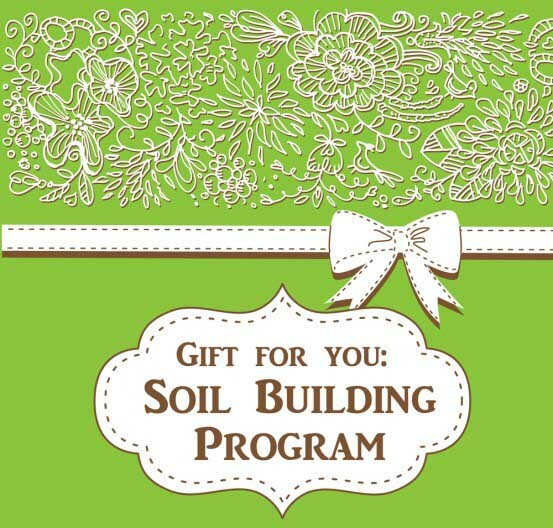 Consider gifting the gift of a full year of organic lawn fertilization. Shopping for “stuff” can be stressful…and there’s no guarantee your loved ones will really need the stuff you’ve bought them. If you’re goal this season is thoughtful and useful giving, why not consider giving the gift of time? Life is busy for all of us and often we just don’t have enough time to spend taking care of our lawn and landscape the way we might like. Do you have an organic gardener on your list this year? Perhaps your daughter has just purchased her first new home, your son has a new baby on the way, or your parent could use a helping hand around their landscape. If so, you might consider gifting the gift of a full year of organic lawn fertilization. Through our organic Soil Building Program, we offer year-round soil feeding, pest and disease control, and weed suppression. Our approach is a natural one to keeping your lawn green, healthy and chemical-free. We’ll visit your lawn (or your gift recipient’s lawn) eight times to throughout the year, with follow ups as needed. That’s a lot of time you won’t have to worry about spending on yardwork! Managing and caring for your lawn can be time consuming. Between trips to the garden center to purchase the right fertilizer, fretting over choosing the right fertilizer or amendments, and then applying them at just the right time in the right amount, it can be too much to keep up with. It’s easy to see why many homeowners put off feeding their lawn or simply forget to do it. For the new homeowner. Give their landscape a fresh start by starting the year off right with organic lawn care. For the new parents … even for furry babies. An organic lawn is the best place to play. No harmful chemicals to worry about, especially if you have kids and dogs that like to roll around in the grass. For the full-timer. Know someone who always seems to be at work? They could for sure use some help. Reducing the time they spend on their lawn might give them more time to actually enjoy it! For the retiree. Know someone who travels, but wants to always come home to a healthy lawn and landscape? Not having to worry about fertilizing and watching out for pests while they are away will alleviate a lot of stress. Our organic Soil Building Program uses a combination of treatments throughout the year. Liquid compost extract, fish emulsion, humic acid, earthworm castings and a host of other amendments are added at various phases of maintenance throughout the year. We also help you to manage weeds and can also apply additional amendments at no extra charge if needed. We’re so confident your gift recipient will love the results that we guarantee it. Ready to holiday shop? We can handle it all online.